Getting our work-life balance into better balance is a challenge for any father. Work schedules, seasons, relationships at work and home and many other factors can influence work-life balance positively or negatively. Dads can usually tell when they are not in balance anymore because things just don't feel right at home or at work. 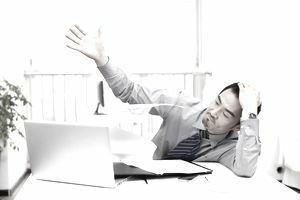 For those who run their own businesses or have jobs that consume their lives, those feelings associated with being out of balance happen much more frequently and often with greater intensity. Without time and focus to restore balance, we find ourselves experiencing symptoms of stress, dysfunction, relationship friction or just plain burnout. For those who might feel out of balance and that work has become the very dominant component of that delicate relationship between work and life, you may want to ask yourself these ten key questions that will help you diagnose your work-life balance and identify strategies of coming back into a positive state of life equilibrium. Do you focus too much on getting it just right? Is your workspace out of control? Workspaces that were clean with papers filed and that were well designed seemed to be the norm. A lot of clutter will tend to lead to overload, burnout, and lack of balance. The old rule of taking any given report, file, or piece of paper and then "TRAF'ing" it (Trash, Refer, Act, or File) is good advice. David Allen of fame suggests putting everything in an in-basket and following a carefully laid out way of processing. If your desk, office, workplace or table needs some help, these resources would be good for your consideration. Do you stay at work late just to prove your worth? In today's competitive work environment, sometimes we fall into the trap of staying late (or coming in early) to impress others with our commitment and dedication. But for every positive impression you are creating with that strategy at work, you are creating a negative one at home. It is not all about the hours you spend, but how effectively you perform during the hours you have. Bosses tend to be more impressed with performance than long hours. So work a little smarter and check out these ideas for being a more productive employee. Is your social life on life support? When we get out of balance, we tend to ignore friends and family before we give up on other time-consuming activities. When was the last time you spent time with friends? When was your last "date" with your wife or significant other? Scheduling time on your busy calendar for socializing at work, at home, at church or in another setting with people will help you make time for others. Making social life a priority is an important key to helping keep it all in balance. When we get disconnected from friends, co-workers, and family members, our work-life balance feels out of whack. These ideas might help you enhance your personal social network. Do you find that work is your activity of choice? When you find yourself with that rare hour or two that is not programmed, do you head into work to get caught up or even work at home? If you do, it is a great sign that you are out of balance. While work is often the most consistent demand on your time because it cries the loudest, it usually can wait just a bit while you focus on other aspects of life that should be more rewarding and contribute to your own well-being and that of your closest contacts. So if the siren call of your employer or your business seems just too irresistible, check out some of these ideas for non-work activities. Is your temper is flaring more and more? Do you have a hard time sleeping, or sleeping well? Do you have to repeatedly reintroduce yourself to your family? The wife of former Colorado governor Richard Lamm related the story of one rare evening where the Governor returned home before his children's bedtime. His young son ran up to him, jumped into his arms and yelled, "Daddy!" After seeing this, Mrs. Lamm commented that her son was a literal genius. "He meets a man once in his life and remembers his name!" she said. If you are feeling like a stranger in your own home and with your children, it is time to set aside more time for family and regain your balance.